Steven Aguirre is a young and trustworthy man who wishes to expand his business. This man has accomplished an incredible amount in his short life. STEVEN can do just about anything- he is a family man and wants to get ahead. You can be assured he will drive responsibly and be there to assist you. WHAT STEVEN CAN DO FOR YOU! He worked as an assistant engineer in the turbine house at the local hydro electric facility. He has done 300 hours on a residencial electric course. He has done 300 hours on computer basics. He has a bachelors degree. He can do plumbing, gardening and many more jobs - Oh! did I mention he owns and runs a taxi and can pick you up or drop you off at the airport. He speaks basic English and can be trusted. 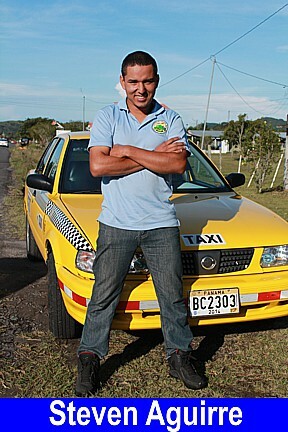 Steven also has a private car that you can hire (with him as driver) and he can take you to all the sites and places in the Volcan or David area. If you are new to Panama this might be a wise first move - wait until you see how they drive, then you will agree this is the smart and safe way to start in Panama. He also operates as a normal local taxi driver.